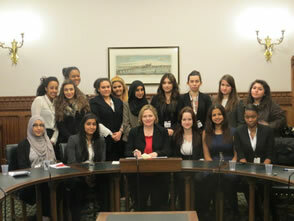 To mark International Women’s Day 2013, local MP Mary Macleod invited young women from across the UK to shadow MPs and House of Commons staff. The theme for the day was ‘Connect Girls, Inspire a Generation’. Nineteen students from the Brentford and Isleworth constituency were nominated by their head teachers to take part in the event. MPs from across all parties were encouraged to take part and inspire a new generation of women to consider a career in politics or as future community leaders. The students attended a number of events to mark the day, including a tour of Parliament to learn about its history and functions, a visit to Number 10 Downing Street and a chance to listen in on the House of Lords Debate on International Women’s Day. The day ended with an afternoon tea reception where all the girls from across the UK came together and were welcomed by The Speaker of the House of Commons, The Rt. Hon. John Bercow MP. Mary commented: “I was absolutely delighted to see so many MPs and members of House of Commons staff taking part and inspiring the next generation of leaders. I hope that the young women enjoyed their day and leave with a positive message about political life and how they can get involved. I was impressed by the political awareness, maturity and confidence shown by the young women from my constituency. They suggested some very creative and innovative ideas on how to improve their local area and I hope we can work together to implement some of these in the future. It is important that we continue to work to increase the representation of women in Parliament and I hope that in a few years some of these young women will return as MPs”. The local students were nominated by their head teachers to participate in the day were from the following schools: Gumley House Convent School, Hounslow Manor School, The Heathland School, The Green School and Brentford School for Girls.